Whisk lime juice, lime zest, chile peppers, and sugar together in a bowl until dressing is smooth. 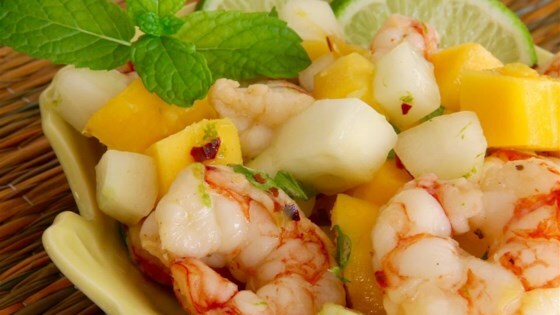 Combine shrimp, mango, cucumber, and mint in a bowl; add dressing and toss to coat. Drizzle vinegar over salad. Loved this recipe! Did not add hot chile peppers or rice vinegar though. But loved that this recipe was light, healthy, & tasty. I will be making this again as a lunch option to take to work l! I added diced avocado to this recipe. A new favorite.